Last Saturday afternoon I treated my Dad and Mum (and Stuart and I) to a Red Letter Day out for Dad's belated birthday treat. We went to see the latest production of Chicago at the Phoenix Theatre in London's glitzy West End followed by dinner at Balthazar in Covent Garden. The show was great. The Bob Fosse production was brilliantly executed by the muscled dancers and the band was sensational. 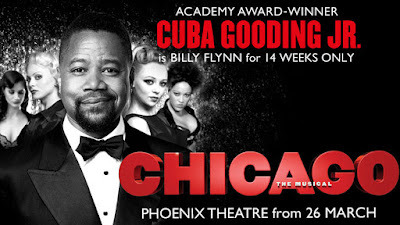 Cuba Gooding Jr. played Billy Flynn - he can act but the singing... not so much. Sarah Soetaert was a wow as Roxie Hart, Josefina Gabrielle great as Velma Kelly and Ruthie Henshall cooked up a storm belting out her Mama Morton. A special mention needs t go out to Alan Richardson who blew us away and to Paul Rider whose Mr Cellophane was great. If you like Chicago this is a good version. We perhaps weren't quite as bowled over as when we first saw the big West End production 15 years ago but it is still a very good show. Funny too.